Ok, I may not be able to string three coherent thoughts together this week, but here is something I CAN do- I can answer fifty nonsensical, baseless, fluff questions. Exactly what I need, if hardly riveting reading… Courtesy of Susan at Strange Pulse, who happened to be my very first Blog friend from years ago. I love Susan. 1. Do you like blue cheese? Oh yes, the stinkier and more like Colston Bassett Stilton the better. 2. Have you ever smoked a cigarette? Only once- at a sleepover in 4th grade.. Ew. 3. Do you own a gun? Not me. 4. What flavor do you add to your drink at Sonic? I don’t think I’ve ever been to a Sonic. But at In-N-Out, I’ll take a strawberry shake and a grilled cheese, no onions. Mmmmm. 5. Do you get nervous before doctor appointment? Only if it’s for something scary. 6. What do you think of hot dogs? I think they’re gross and super yummy- no ketchup please. 8. What do you prefer to drink in the morning? Water. A big glass of icy water is fantastic. 9. Can you do push-ups? Ha ha ha! 10. What is your favorite movie? I can’t pick just one. I love Gone with the Wind, Pride and Prejudice, You’ve got Mail, The Color Purple, The Godfather, Fried Green Tomatoes… a theme? Mostly chick flicks. 11. What’s your favorite piece of jewelry? Only thing I wear—my wedding ring. 12. Favorite hobby? Writing, sewing, painting, creating, cooking, drawing, stained glass, antiqueing… I do not garden. I do not sing. 13. Do you work with people who idolize you? I work with small children who use me for a human napkin all day. Idolize? Not a chance! 14. Do you have ADD? Nope. 15. What’s one trait that you hate about yourself? I don’t hate anything- I have body issues like many women, but I don’t hate myself. I wish I was more able to follow a routine and be less flighty, but then again, that’s part of what makes me, me. 16. What’s your middle name? Leigh. -We need to rake the enourmous drifts of leaves piling up in the backyard. -Beanie, get that horrid stinky nasty peanut butter smelling thing away from me before I crawl out of my skin! 18. Name 3 things you bought yesterday; A rare trip to the grocery store allows me to answer this one- popsicles, sharp cheddar cheese and milk. how. exciting. 19. Current worry right now? Oh nothing- life is peachy- nothing at all to worry about. 21. Current hate right now? Politics. 22. Favorite place to be? Picking fruit and vegetables at the farms north of town with my kids. 23. How did you bring in the New Year? I think I was asleep. 24. Where would you like to go? All over the world. I love to travel- anywhere and everywhere. 25. Name three people who will complete this? Are you kidding? I have no clue. 26. Whose answer do you want to read the most? I hate this questions. There’s my hate answer. 27. What color shirt are you wearing? Can a pink bathrobe be considered a shirt? Heather O. sent it to me, if that helps…? 28. Do you like sleeping on satin sheets? Gah! No! Horrid! Blech! 29. Can you whistle? It’s pitiful, but yeah, I guess you can call it whistling. 30. Favorite color? Crispy green apple green. Or blue. Or Autumn. What? It is too a color. 31. Would you be a pirate? Only if I could be on Johnny Depp’s ship. 32. What songs do you sing in the shower? I spare the world and usually do not sing in the shower. I do like my showers in the dark, though. 33. Favorite girl’s name? I have a hard enough time naming my kids, I don’t have a spare list of names I like. Oh fine. Persephone. 34. Favorite boy’s name? See above. Henry or Jack. Both of which were vetoed in the search for names for our sons. 35. What’s in your pocket right now? A receipt from the grocery store, and a blue Lego. 36. Last thing (Person) that made you laugh? Tina Fey or Jon Stewart. 37. Best bed sheets as a child? Holly Hobbie. 38. Worst injury you’ve ever had? I’ve been pretty lucky with injuries. I broke my foot as a teenager, and I had three babies the old fashioned way- does that count? 39. What is your favorite snack? Chewy crusty bread, apples and cheese! 40. Favorite thing to do on Sundays? Why, getting ready for church with three small kids, for sure! 41. Who is your loudest friend? Mo! 42. How many dogs do you have? None. Stella is enough for me. 43. Does someone have a crush on you? You’re kidding, right? 45. What is your favorite book? Charlotte’s Web. Or, Their Eyes were Watching God, by Nora Zeale Hurston. And I hate Oprah made it into a movie. Read the book, skip the movie. 46. What is your favorite candy? Lemon drops. Lemonheads. Lemon lemon lemon anything. 47. What is your favorite sports team? Huh? What? 48. What song do you want played at your funeral? Sufjan Stevens version of Come Thy Fount of Every Blessing. 49. What were you doing 12 AM last night? Snoring and probably drooling on my pillow. 50. What was the first thing you thought of when you woke up this morning? Oh crap, we’re going to be late for school! I’m not so myopic that I think what I’m going through is unique or even that special. It’s not. It’s just life- sometimes life is hard. But I also get that things change, and looking back on my life, I know hard things don’t last forever. That’s the rock I keep clinging to- It’s not a whole lot, but there it is. Hopefully soon, I will be able to look back at this year and count the tremendous blessings that have come from this trial- I could do so already, but I hesitate because I am skittish and fearful from being kicked so many times. The job is only a part of it- and while getting a job would fix a great deal, it wouldn’t make for instant perfection. It would, however, give me the breathing room to look around, squint at the unfamiliar sunlight, and gingerly dust off my tattered and sore arms. A childhood friend of mine lost her husband Wednesday morning to a heart attack. She is my age, and expecting her third child in December. If you have any extra prayers hanging around, maybe you could throw them her way? When will this year be over? I ache. I hate bedtime. I really, really hate bedtime. It seems, due to my sucky organizational skills and my less than structured nature, bedtime is chaos in this house. Tonight, Bean and Abby were downstairs when I called for bedtime. Jeffrey was outside swinging. In his jammies, with new white socks in the dirt. David was taking a phone call. No one listens to me. Much whining, crying and gnashing of teeth later, all three kids are in bed, David is still on the phone, I’m covered in sweat and all ticked off. We don’t do baths every night. Call me a bad mom (I dare you) , but I think every other night is more than enough torture, thank you very much. But we do have what passes for routine. Jammies, teeth, reading time, kisses and prayers, lights out. I may not be consistent about much, but that’s pretty solid. So why, WHY is every night utter chaos? Why do they run, hide, get naked, beg for a bath on Not Bath night? Why on Bath Night do they run and hide under the bed? Why is getting them to bed such an exhausting, teeth-gritting way to end the day? I hate it. I don’t want to end my day mad at them. And will someone PLEASE tell me why all kid’s toothpaste is blue glitter? Why? WHY? Because when it dries, and it surely will, it’s like quick-crete mortar, and you need a chisel to chunk the stuff from your bathroom mirrors and counters and sink and floor- because a four five year-old can get toothpaste everywhere, including the shower, but he CANNOT get it on his TOOTHBRUSH. I know someday I will look back on this time and wish for it. I know snuggling with babies is divine. I know these sweet little bodies will not always clamour to be in bed next to me, to rub my cheeks, share my pillow, read the book again, kiss me again, and a dozen other spontaneous ways to stall sleep. And I was going to put a “but” in there, and make a snarky comment about how I really just want it to be easier… then I read what I just wrote. Everyone right now, prayers please!- second interveiw, 9:30 this morning. When in a hurry putting small girl-child to bed, please remember to put a diaper on said child before putting on footie-jammies. In omitting this step, the laundry consequences are indeed catastrophic. That is all. Allow me to introduce you to the most disgusting, nastiest shampoo ever. Want to smell like an old mothball? Like the smell of wet-dog? Enjoy the way the old man down the street who sits on his porch yelling at neighborhood kids while smoking a stogie smells? Then this is the shampoo for you! 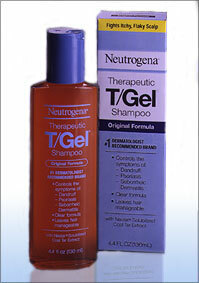 Recently my head has decided to be a little itchy and dry, and I normally love the Neutrogena product line. My favorite moisturizers, cleansers and eye make-up remover all bear the Neutrogena label. Even the T-Sal shampoo is wonderful, so it seemed a good bet to give this one a try. Big mistake. Like, seriously wretched mistake. When I popped the bottle open in the shower, the viscous, nearly black gel glopped into my hands, and I was immediately assailed by one of most gag-inducing smells ever to come from a shampoo bottle. Still being swayed by misplaced brand loyalty, I thought “It can’t really be that bad- and maybe it will make my head stop itching…” Wrong! As soon as I sudsed up my hair, I knew the smell was going to make me wretch. Immediately I started rinsing and rinsing and rinsing… to no avail. Three shampoos later, with all the fragrant stuff I could find, my hair still smells like mothballs. Really. And I still itch. I smell like an old man in a mothball sweater walking a wet dog. So if you like that idea, this is the shampoo for you. Otherwise, run.